In this lunchtime lecture, Ronnie Kasrils, founding member of Umkhonto we Sizwe, former Minister of Intelligence and author of A Simple Man: Kasrils and the Zuma Enigma, gives insights into President Jacob Zuma’s character (both real and mythical), and how South Africa came to be led by the wrong man, or a man gone wrong. Kasrils,R. 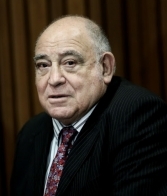 A Simple Man: Kasrils and the Zuma Enigma. Johannesburg: Jacana. Born in Yeoville, Johannesburg, in November 1938, Ronnie Kasrils is a descendant of immigrants from Latvia and Lithuania. He was educated at KES and worked in film studio and in advertising before the Sharpeville Massacre set his life on a radically different course. A founding member of Umkhonto we Sizwe, he was appointed deputy Minister of Defence in the first democratically elected government of South Africa, and also served as Minister of Intelligence, and of Water Affairs. His autobiography Armed and Dangerous, first published in 1993, was updated and re-published in 1998 and 2004. His second memoir, The Unlikely Secret Agent (2010) gives a personal account of his wife Eleanor's courage against the apartheid powers. It won the 2011 Alan Paton Award. His latest book is A Simple Man: Kasrils and the Zuma Enigma.